Big cities are constantly under pressure to provide an increasing number of people with living space. Small-scale densification has not been sufficient to resolve this problem for some time now, and large plots of land available for construction in inner cities have become rare. Cities have been repurposing centrally located, former industrial and commercial zones for a long time. Surprisingly, here and there, there are still opportunities to do this. As a result of the consolidation of small hospitals, the land plot beneath the well-known Finkenau Women’s Hospital in the Hamburg Uhlenhorst district (east of Outer Alster) became free. Due to its quiet location next to Eilbekkanal, it is a particularly good place for a mixed and varied residential district. The simple orthogonal development concept included small-scale subdivisions, as well as residential block construction. During the preparation for the tender for the land plot, the proven, centuries-old, land-saving and prestigious concept of the townhouse had to be considered as a possibility to achieve a good mixture of buildings. With this ambitious goal in mind, wph tasked eight different architects with developing different types of houses along the Dorothea Bernstein Road. In 2013, this development area was assigned to wph Wohnbau- und Projektentwicklung Hamburg GmbH. With the participation of architects and architecture firms Baumschlager Eberle, LA´KET, Kraus Schönberg, Heitmann Montúfar, TCHOBAN VOSS, Spengler Wiescholek, SCHOPPE+PARTNER, Breimann & Bruun and Planwerkeins Architekten, diverse, architecturally ambitious types of townhouses were created, whose individuality can be seen only upon a second look. The typology of a townhouse should create a reference for the surrounding area, make flexible use of changing living and work requirements possible, and correspond to local features. 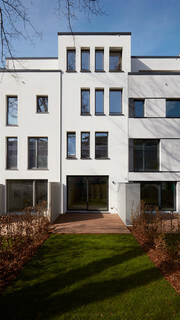 For the urban planners, it was important that the 26 designer townhouses work together as a unified whole as part of the overall development site. Accordingly, they set a maximum of four storeys in the development plan. 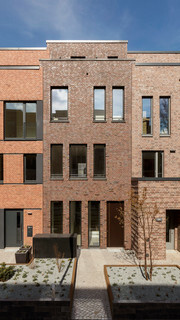 Further requirements included: red clinker brick as the street-facing façade material; white plaster for the garden side; and unified spatial design. The width of the buildings varies between 4,75 and 6,5 metres. Depth offsets, recesses and projections in the façade provide space for covered outdoor seats. Tim Brendel, the architect from Vorarlberg, heads up the Hamburg architecture firm Baumschlager Eberle. His motto is «Architecture is a passion, and passion takes planning». A motto that was applied in the planning for the show house by Baumschlager Eberle. For all of the architects the stairs were the central design element. Like a sculpture, the single-run stairs hang freely on a bracing wall, with a solid, white painted steel railing. An unusual feature of the Baumschlager Eberle design is the placement of the kitchen and dining area on the first upper floor to allow access to the garden directly from the living room. The buyers could customise the inner furnishings of the houses using a large variety of high-quality durable materials, sanitary items and kitchen appliances. wph opted for parquet by Bauwerk. Light Avorio was the shade selection for the large Villapark Oak one-strip planks. This design is timelessly beautiful and fits well in the general concept, which strives to outlive the current zeitgeist both formally and structurally. Villapark 1-strip plank stands out because of its generously sized format of 2100 x 190 mm and a top layer of 2.5 mm. Full-area bonded, it guarantees silent footsteps. Furthermore, this product line stands out for its optimum energy conservation through ideal heat transmission when combined with radiant floor heating. Its low installation height ensures optimum conditions for renovations and makes it easy to combine Villapark with other floor coverings, such as floor tiles.